If you are wondering just how many Letters of Recommendation you need, how to ask for one and from whom, you’ve come to the right place! By the end of this article, you’ll have found answers to most, if not all of your LOR related doubts! Most universities in the USA and Canada ask for no less than 3 LORs, of which, preferably 2 should be from professors who have taught you in college; or academicians, under whose guidance you have performed research or published papers. The 3rd LOR, in case you are a working professional, can be from your immediate superior at work or someone whom you’ve worked with closely as a professional. Whether you’re a final year student, someone who has just completed their undergraduate program or a working professional, the process of asking for a letter of recommendation remains more or less the same. However, a letter of recommendation written by your professor is considerably different from one written by your manager at work. There are different parameters that need to be incorporated in both cases. The internet provides you with a number of different styles and formats of LORs. However, the challenge is the process of asking for a letter of a recommendation. Whom to approach? What to say? What to write? These are just some of the common thoughts running through the minds of students when confronted with the task of procuring 3 LORs! The motive of the candidate should be very clear throughout, taking into consideration the following factors, prior to asking for a letter of recommendation. 1) Testimonials: Before you write to your professor or manager asking for a letter of recommendation, you may want to keep in handy all the testimonials supporting your educational background, extra-curricular achievements, workplace achievements and appraisals as your referrer might want to peruse these documents before writing your LOR. 2) Plan in Advance: Universities in the US/UK/EU notify candidates in advance regarding the date by which the letters of recommendation have to be submitted. While most universities ask for LORs to be submitted along with the formal application, anytime before the application deadline, some universities prioritize its submission, asking for it to be sent separately, either via email or as a physical copy. It’s always a good idea to plan well ahead, to give your referrer the maximum possible time to gather a good idea about you and the course that you’re applying to, so that they are able to write you a strong, compelling and authentic letter of recommendation instead of putting it off until the very last moment. Remember, haste makes waste! 3) Determining your referrer: This is perhaps the most challenging step in the entire process of getting a letter of recommendation. You may not be really sure who you want to ask. While deciding on whom to choose as your referee, remember, the more recent your interaction with them, the better, as the universities want to know more about the current you and not who you were years ago! If it has been several years since you graduated from college, it might be a good idea to provide LORs from people who have worked closely with you more recently – generally your immediate superiors at work. If, during your college days, you shared an excellent rapport with your professors, or stood out owing to your outstanding academic performance/extracurricular achievements, things ought to be relatively easy. However, if you were one of the backbenchers, who never let an opportunity to bunk classes slip by, or one of the silent ones who never really got noticed that closely by the professors, choosing someone who can write you a glowing letter of recommendation can be a tough call indeed! Even then, you don’t really have to worry. Asking for a letter of recommendation won’t cost you an arm and a leg. All you have to do is follow these simple techniques. Approach them in person in your college, have a word or two, share some of the challenges and responsibilities you’ve shouldered at work, and perhaps appreciate him in front of any current student of your college. This ensures the rekindling of a good personal relationship which you may or may not have had during your college days. There’s no harm in trying, right? Ensure that your professor gathers a good idea about you. Remind him of some of the instances from his classes that you can recollect, and some fond memories from your tenure as a student of that institute. In the process, slowly veer the discussion towards your intent of pursuing graduate studies abroad, once you sense that your professor would be comfortable in writing you a letter of recommendation. On the professional front, you have considerably more leeway, as it is not always mandatory for your past employer or manager to be the one sending your LOR. Apart from them, you can also approach any business acquaintances, customers, colleagues and advisors whom you have worked closely with. Politely inquire about their availability and ask them what documents they might require in support of your application for a letter of recommendation. Keep in mind that you do not push either your professor or your manager to write you an LOR as in that case, they may not draw a good idea about you and might not be comfortable in writing you a letter of recommendation. At the end of the day, keep in mind the quantum of the personal relationship between you and your referrer. 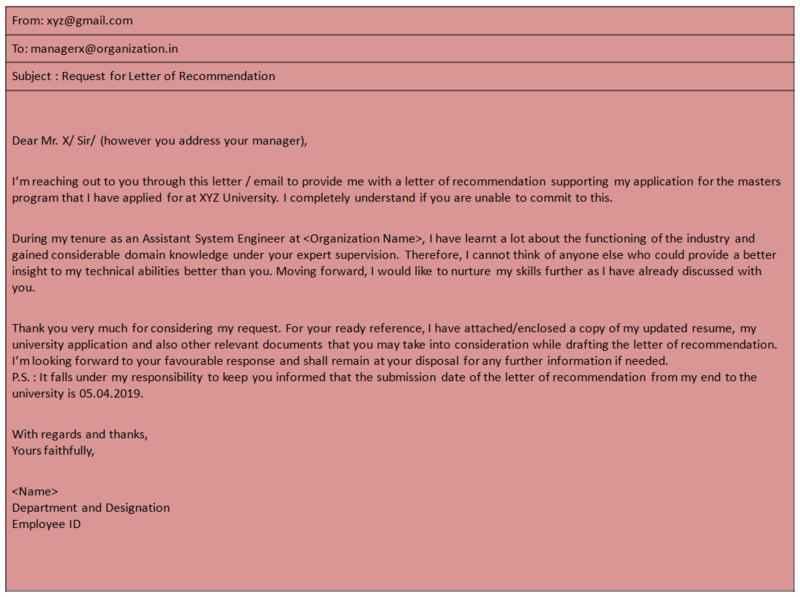 4) Frame your request letter: It is imperative that you frame a convincing request letter to your professor or manager. Therefore, don’t rush with this step. Evaluate the tone of your request carefully. Always ensure that you respect the formal or professional boundaries that exist between you and your referrers, and consider their time availability before proceeding with your request. Humbly make a request to write you a reference letter and intimate them about the original date of submitting the letter of recommendation to the universities and attach copies of all your supporting testimonials along with your request letter. 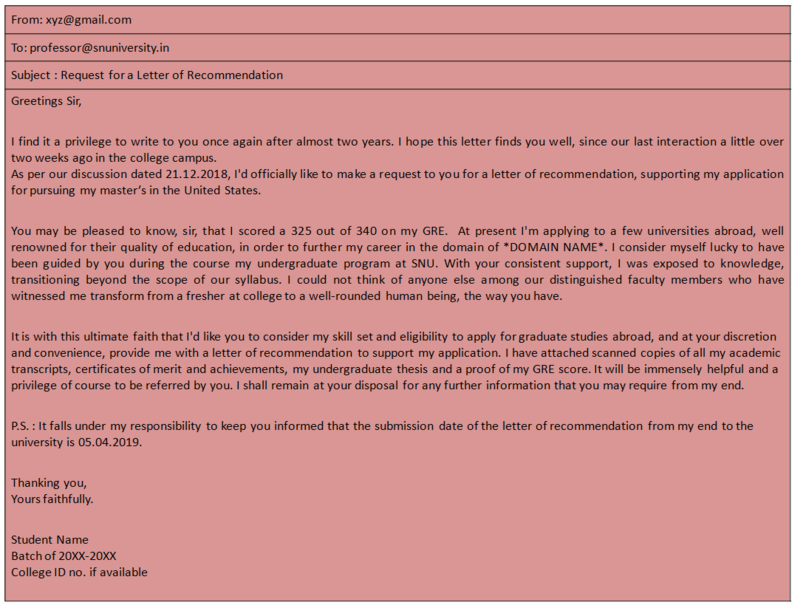 Now, if you’re wondering what the format of your request letter ought to be, here’s one you can write over an email to your professor requesting him for a strong letter of recommendation. Now, in the letter above, can you see how adeptly the request has been framed? If you notice, the letter has been opened with a touch of nostalgia that usually triggers an emotion within the minds of the reader. The writer i.e. the candidate offers humble greetings and maintains due respect, and in keeping with the general format of formal letters, the intent of writing the letter has been clearly mentioned in the first paragraph itself. You should also remind your referrer about your achievements and let them know how grateful you are to them for their efforts, as an average college professor, deals with 500 students on a day-to-day basis. So, obviously, he may find it difficult to recall your achievements in particular, especially if a considerable amount of time has passed since you last interacted. Do not forget to attach/enclose your academic transcripts and every other proof of your educational or co-curricular achievements and other documents as you would want them to testify for your eligibility without missing out on any relevant details. Always maintain a tone of politeness in your request letter and leave it at the discretion of your referrer to provide you with a letter of recommendation. Refrain from coaxing him/her repeatedly or expressing immediacy. Allow your referrer the time to write keeping in mind that they have a hectic schedule and might need to go through the information that you have provided before beginning to write the letter of recommendation. Now, in the case of working professionals, you will need a letter of recommendation from your manager, or your manager’s manager or maybe a departmental head. Just like requesting a professor for a letter of recommendation, requesting the same in your workplace too involves a certain protocol. Take a look at a sample format of a request letter to your superior at work below, and then I’ll run you through the things you need to keep in mind for the same. When requesting a letter of recommendation from your manager, the following are the things that you need to keep in mind. It is imperative that you respect your manager’s time and understand that your request will need him to invest additional time and thought in the work. Do not rush him, but instead, allow sufficient time and discretion. Do not push your manager or any higher authority to write you a reference letter. The request letter for an LOR from your employer/manager falls under the category of a business letter. Therefore, it should be very precise and crisp. The letter must invoke in the mind of your manager the urgency but at the same time, express your feeling of gratitude towards him. Since you interact with your manager almost on a daily basis, the need to remind him of glorious or memorable incidents is not required. That might give an impression of flattery which may be unfavorable. If you are provided with a letter of recommendation by your professor/employer, do not forget to send him a separate letter/email to thank him adequately for his time and efforts. You must realize for yourself that the process of acquiring a letter of recommendation had, at one point in your life, been a nightmare. Now, it must have occurred to you that there might arise certain challenges in the entire process of requesting the letter of recommendation from your professor/manager. What could these challenges be? 1. A limited number of LORs to be provided by your professor: It might be the scenario that your professor is willing to share only a handful of LORs and there’s a rat race going on between you and your fellow batchmates. In that case, try to be one of the first applicants. An early application is always a safer proposition than putting it off till days before the deadline. Keep your transcripts and other documents ready beforehand and be among the first ones to request a letter of recommendation. You just might have the chance to make the cut. 2.Not willing to share personal details: Often, your referrer may not be comfortable with sharing details like contact numbers or address of correspondence with the institutions that you are applying to and the underlying reasons for this could be personal. It will not be a good idea to approach him for the reasons and instead, you might want to provide him with alternatives. Respect his decision and ask if he is comfortable with sharing his professional email id, workplace telephone number or other relevant credentials. Discuss with him how you may benefit with these details as admission officers from universities abroad tend to contact referrers at times to verify the authenticity of the LOR. 3.Reference Letter to Referrer Ratio: It is important that you understand, that the more number of reference letters you produce, it substantiates more of the information you provide in your admission application. If you require two letters of recommendation to be submitted, make a request to at least five professors/managers or higher authorities. You will then be able to produce the best reference letter according to you, to support your application. For this, it is recommended that you maintain a sound inter-personal relationship with your professors and managers and get known through your skills and contributions. Even if you are a student in your final year and are looking forward to starting your master’s program in the ensuing year, it’s not too late. You still have a lot of time for building professional relationships. 4.Documents: It is a good idea to provide your professor with a brief summary of your undergraduate career in writing. A compilation of your projects, workshops, seminars and co-curricular achievements helps your referrer with drafting a convincing letter of recommendation. In your workplace, provide your manager with past appraisal reports, project information and CSR (Corporate Social Activity) activity reports as he may be reluctant to go through the office computer and search for the same. It does not create a good impression if your referrer has to revert time and again, asking for information that could be incorporated in the letter of recommendation. Therefore, it is always safe to keep all your documents ready and provide them the same for reference. Allow your referrer to filter the documents and determine what he chooses to mention in the letter. 5.Confidentiality: If your referrer wants to keep any information confidential, always respect that. Do not coax them into sharing what he/she might have written. Many universities demand sealed envelopes containing the application and letter of recommendation from the candidates. In that case, your referrer may seal the envelope containing your reference letter beforehand. Do not try to open and peek into the envelope as the slightest mark of breach of confidentiality may be treated as a tampered document and may result in your candidature being disqualified. I believe you now have a detailed insight into the process of acquiring a letter of recommendation, whom you should approach to get one, and what the steps are, in requesting for the same. Always keep in mind that it’s a simple request that you are making. The fulfillment of the request depends completely on your professional etiquette, behavior, interpersonal relationships and most importantly, your own achievements. A strong letter of recommendation is one which testifies the true capabilities of a candidate from both the educational as well as co-curricular standpoints and acquiring a letter of recommendation falls under your interest as it would state facts about you. So take a deep breath and imagine yourself holding a letter of recommendation for yourself. How would you like to read it? 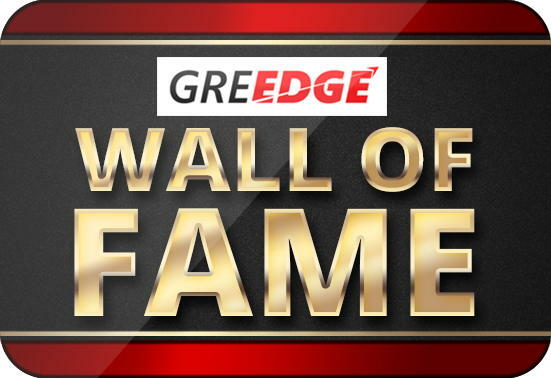 What would you like to be mentioned in it? The decision is always yours to make. I wish you all the success with your university applications process as well as with getting the best LORs for your profile! Next story Best Letter of Recommendation(LOR) Format for MS: How Should It Be?